Our Abpromise guarantee covers the use of ab10590 in the following tested applications. IHC-Fr Use a concentration of 0.5 - 5 µg/ml. WB Use a concentration of 0.1 - 0.2 µg/ml. Predicted molecular weight: 8 kDa. Immunocytochemistry/ Immunofluorescence - Anti-RANTES antibody (ab10590)Image courtesy of an anonymous Abreview. 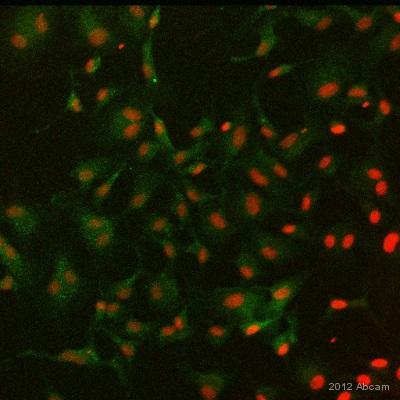 ab10590 staining RANTES in human endothelial cells by Immunocytochemistry/ Immunofluorescence. Cells were fixed in paraformaldehyde, permeabilized using Triton, blocked with 1% BSA for 1 hour at 25°C and then incubated with ab10590 at 2µg/ml for 1 hour at 25°C. The secondary used was an FITC conjugated goat anti-rabbit polyclonal used at a 1/100 dilution. Counter stained with TO-PRO3. ab10590 staining RANTES in Human liver cancer metastases by Immunohistochemistry (Frozen sections). Tissue was fixed with paraformaldehyde, blocked with 5% serum for 1 hour at 24°C and permeabilized with Triton X-100. Samples were incubated with primary antibody (in PBS + 0.3% Triton X-100 + 1% BSA) for 3 hours at 24°C. An AlexaFluor®488-conjugated donkey anti-goat IgG polyclonal was used as the secondary antibody. Publishing research using ab10590? Please let us know so that we can cite the reference in this datasheet.